RACHEL O. Beauty is a Chicago-based beauty & fashion expert. Rachel O. Beauty partners with some of the world’s leading brands to empower women to express their inner and outer beauty. In addition to her work with beauty brands, Rachel is a wife and MomPreneur of three daughters. 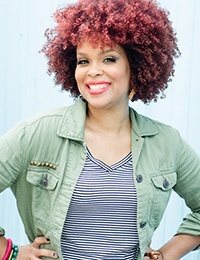 As the creator of Chicago Natural Beauty Meetup, Chicago’s largest natural hair meetup group, she also provides natural hair, makeup artistry, skincare and other educational beauty resources for women in the Windy City. Follow Rachel on all social media @RachelOBeauty visit www.RachelOBeauty.com for more information. I'll admit when it comes to DIY craft projects I am not the most creative person. I marvel at what others can do with just a few inexpensive items found at Goodwill. I get so inspired that I save the items I really like to a Pinterest board. Of all the social media sites, Pinterest is the site that inspires my creativity the most. I can find inspiration for all of my shopping at Goodwill. Click here to check out my Goodwill Pinterest board. As we say goodbye to summer, I thought it would be a great idea to share some of my favorite looks that I found at my local Goodwill. Although I'm definitely not ready to say goodbye to summer and hello to colder temps, at least I can look back and say I sure did look great during the summer 2017 with the help of Goodwill. :) I hope you can see how truly versatile the wardrobe options are, and the best thing is you don't have spend a ton of money to be fashionable and cute! Come along with Goodwill Fashion Expert, Rachel O. Beauty as she shops her favorite Goodwill Store & Donation Center on Washington Boulevard in Chicago! Did you know the average dress size of an American woman is size 16? This means, contrary to what is most often seen in the mainstream fashion industry, women are wearing larger clothing. If you're anything like me you may struggle with your weight and wonder how to dress in figure-flattering clothing. Sometimes you may also find larger clothing to be more expensive! Not to worry, Goodwill is here, and yes, you can find plus size clothing. Watch as Goodwill Fashion Expert, Rachel O. Beauty shares her favorite makeup organizing tips (and other items) she found at Goodwill! Shopping for the perfect dress can sometimes be stressful because, if you’re like most women, you worry about your arms being exposed or the muffin top being on display. I've recently put on a few pounds, and for this reason I am now more body conscious than ever. I guess I should go ahead and consider myself plus size as I now wear a size 10-12. When I shop for the perfect dress, I first consider the occasion, then the structure of the dress, and color. Did I mention how much I hate wearing black? I know most consider black to be "the" slimming color (I don't disagree on this), but vibrant colors are so much more fun and tend to make you stand out more. Take a look at a few cute summer dresses I found at Goodwill. Summer is officially here, and if you live in a city with weather like Chicago trust me; this is the one season we all look forward to annually! This weekend my family and I took a trip to California for my sister's wedding. Erica was truly a beautiful bride, and I was so happy to spend time with all of my relatives and friends to celebrate with the bride and groom. As I looked back at all of the beautiful photos from the weekend, I realized thrift shopping is really in my blood. :) Most of the clothing we wore during our vacation was purchased at Goodwill. If I had to describe my fashion sense in one phrase it would be bohemian chic. I especially love the bohemian look in the summer because of the bright colors and emphasis on free and flowy fabric. Like most thriftanistas the summer season means out with the old and in the new. I went through my closet and donated to Goodwill, and browsed the store for some new boho threads. Take a look at what I found! See how Goodwill Fashion Expert, Rachel O. Beauty gets ready for a Mother's Day celebration with her family ... and see which of the three outfits (purchased at Goodwill) she decided to wear!